We are looking for really smart person, cause in this game you will be the sniper, whose task is to kill all zombies on your way to the win. Just take your gun and kill them all! We know that you can cope with it! Just have faith in yourself! This game is only for brave person, cause you must kill all foes of yours! 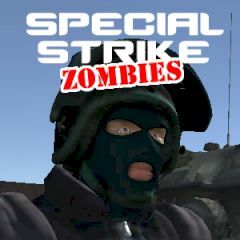 Just imagine that you are special forces soldier and your mission is to use big arsenal of weapons to shoot hordes of zombies and mercenaries, so choose suitable weapon for each wave of enemies in order to survive and successfully complete each level. Do you think that it is so easy? Then just do it right now! It is quite easy to control your player, just use the arrow keys and mouse to shoot. If you are ready for such a cool challenge, then do it!